Hulu’s CATCH-22 Trailer Is Here To Blow Some Stuff Up | Birth.Movies.Death. 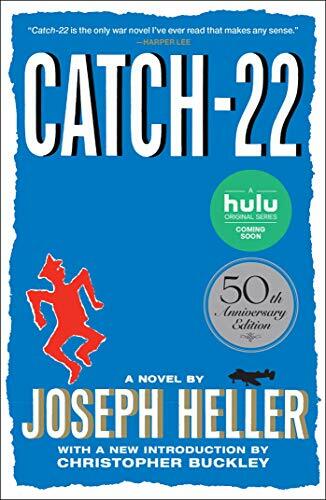 Hulu has released the first trailer for their upcoming adaptation of the classic Joseph Heller novel Catch-22. Produced and directed by George Clooney (who also co-stars, of course), the six-part limited series follows a bombardier (Christopher Abbott) hellbent on just coming out of each mission alive – but the military isn't making it so easy for him (or his balls, apparently). Kyle Chandler looks like he's basically playing the complete opposite of Coach Taylor in this thing. His pep talks do not seem very inspirational and there's a whole lot of yelling. Kyle Chandler yelling. George Clooney yelling. Christopher Abbott yelling. The goats ... not so much. Christopher Abbott is Yossarian, a bombardier, whose frantic obsession every time he goes up on a mission is “to come down alive”. His odds of success at such a simple aim keep getting worse, because Colonel Cathcart (Kyle Chandler) keeps raising the number of missions the men have to fly. More than the retreating Germans, the real enemy for Yossarian and his rag-tag bunch of friends is the bureaucracy of the military, inverting logic at every turn. The pinnacle of this is Catch-22, a military by-law which states that if you fly your missions, you’re crazy, and don’t have to fly them; all you have to do is ask. But if you as not to, then you’re sane, and so you have to fly them. George Clooney stars as the barking mad, parade-obsessed Scheisskopf. Hugh Laurie is the mellow, slightly checked-out Major de Coverley. Clooney directs the six-episode series, along with Grant Heslov and Ellen Kuras. Catch-22 premieres May 17th on Hulu. Y'all excited for it or nah? Sound off below.